Beautifully maintained, move in ready 4 bedroom 2 bath 2129 s ft. Home offers a bright Open split floor plan with ceramic tile throughout. The kitchen features stainless steel appliances, overlooks the spacious family room. The formal dining room completes the main living area and provides a great space for dinner parties. The master suite offers plenty of space for all of your furniture, master bath with dual sinks, garden tub and separate shower. The 3 extra bedrooms are a great size and feature large closets. The backyard is fully fenced and has citrus trees! Plenty of room for a pool and a outdoor kitchen, a 2-car garage and fully fenced entertainer's backyard! New Roof installed 2018 Warranty transferable!! Theres also a room for an RV or Boat. 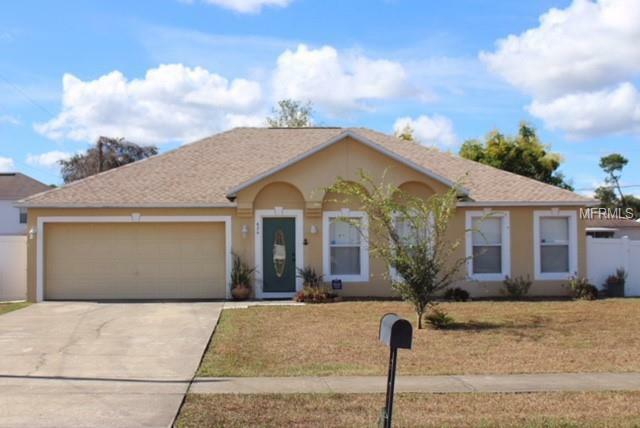 This is a great location minutes to schools, shopping, restaurants, hospitals, I4 and just minutes to Orlando or Daytona Beach and New Smyrna Beach!